There are many models for doing fine work. One approach is to start by clarifying the real results you want to achieve. It is then to go through the following steps. You can relax and recentre. You can refocus and rehearse the strategies you can follow to achieve the desired results. You can follow your chosen rhythm and do your best to achieve the desired results. 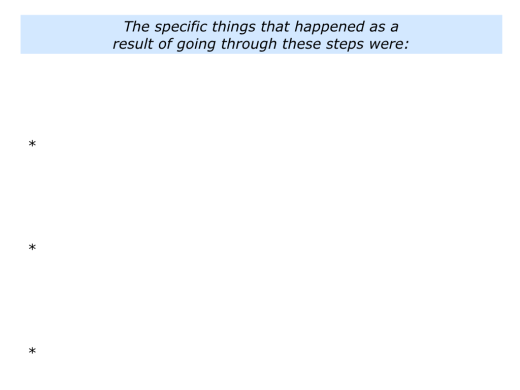 Looking back, can you think of a situation when you went through some of these steps in your own way? This could have been in your personal or professional life. You may have been taking an examination, giving a keynote speech, making a difficult decision, tackling a difficult challenge, leading a project or doing some other activity. 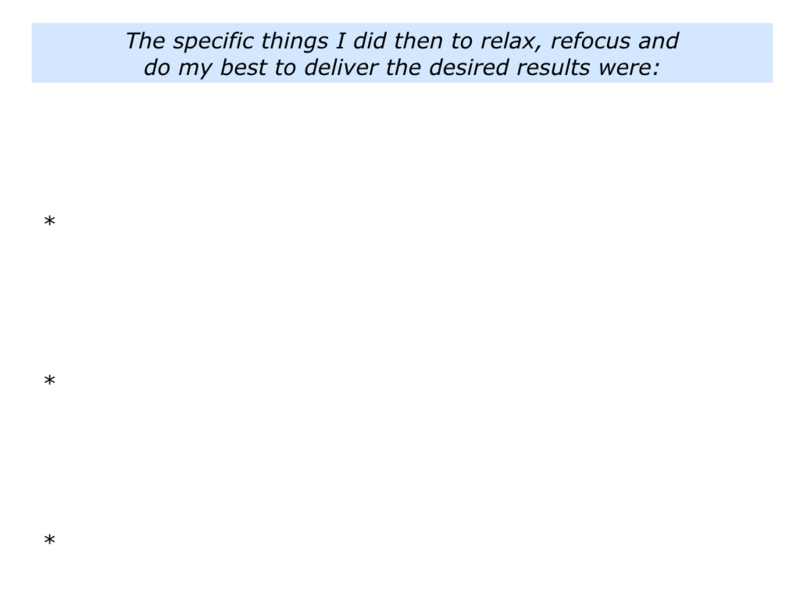 What did you do to relax and recentre? 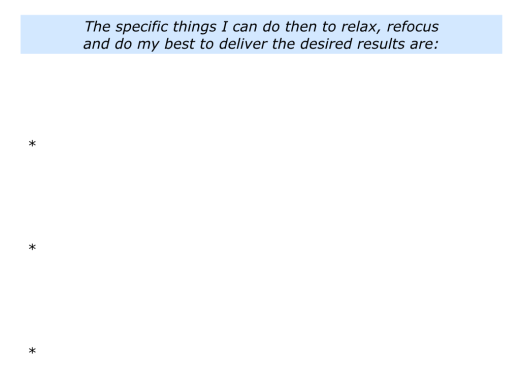 How did you refocus and rehearse your plan for tackling the task? How did you follow your chosen rhythm and do your best to achieve the results? 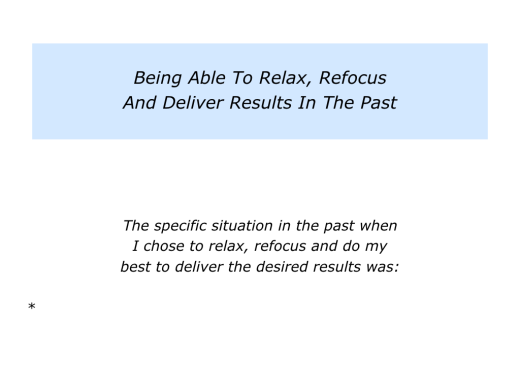 Describe a specific situation in the past when you chose to relax, refocus and do your best to deliver the desired results. 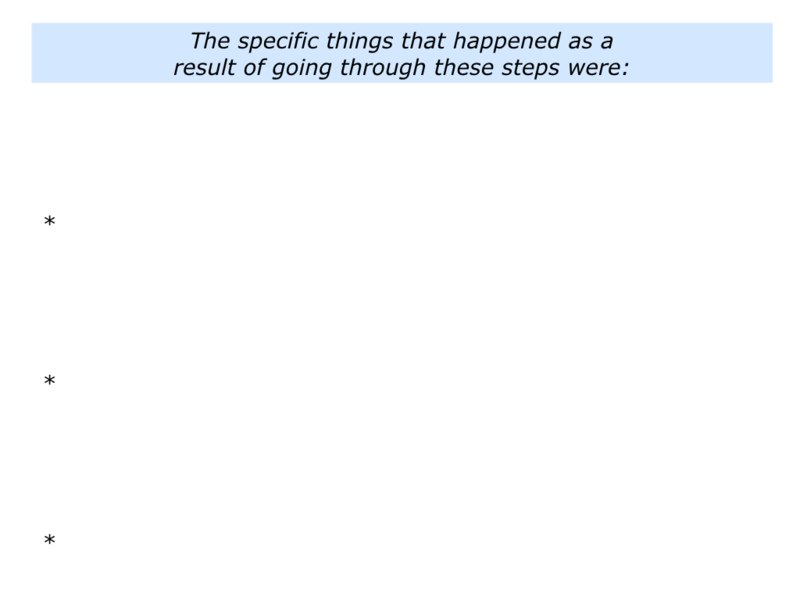 Describe the specific things that happened as a result of going through these steps. Different people have different ways to take these steps. After completing a tiring task, for example, a person may choose to sleep, walk or simply potter around. They may use the time to refresh their body and soul. On some occasions, they may also aim to reflect and learn from what they have experienced. After a while they may feel ready to explore their next possible challenge. Great workers develop rituals that enable them to recentre. The actor follows their favourite routine before stepping on stage. The golfer practices their stroke before making a putt. Some individuals achieve this state by going through the following steps. They develop a sense of inner calm by using deep breathing or another technique. They focus on their values and the things they believe are important. They begin turning their mind to the next thing they want to do in their life or work. “Be calm, controlled and centred,” is the advice that is often given to people. Sounds easy in theory, but it can be harder in practice, especially in the heat of battle. A key element of anger management programmes, for example, is educating a person to stay calm when provoked. This involves a person going through the following stages. They look ahead to anticipate difficult scenarios. They choose a technique for staying calm in the situation. They may choose to use a keyword that acts as a reminder, for example, and enables them to count to 10 before reacting. They role play the actual scene and learn to walk away from the trouble. “I have a ritual for emptying my head and relaxing when thinking negative thoughts. “I put my hand to my head, grab the ‘thoughts’ and throw them away into the air. Imagine that you feel refreshed and want to refocus on the next thing you want to do in your life or work. You may want to write an article, run a marathon, facilitate a workshop, lead a team or whatever. You will start by clarifying the real results you want to achieve and the strategies for achieving the picture of success. The next step will be to rehearse how to achieve your aims. Great workers spend many hours rehearsing ways to achieve success. Sometimes this involves physically rehearsing implementing the strategies. 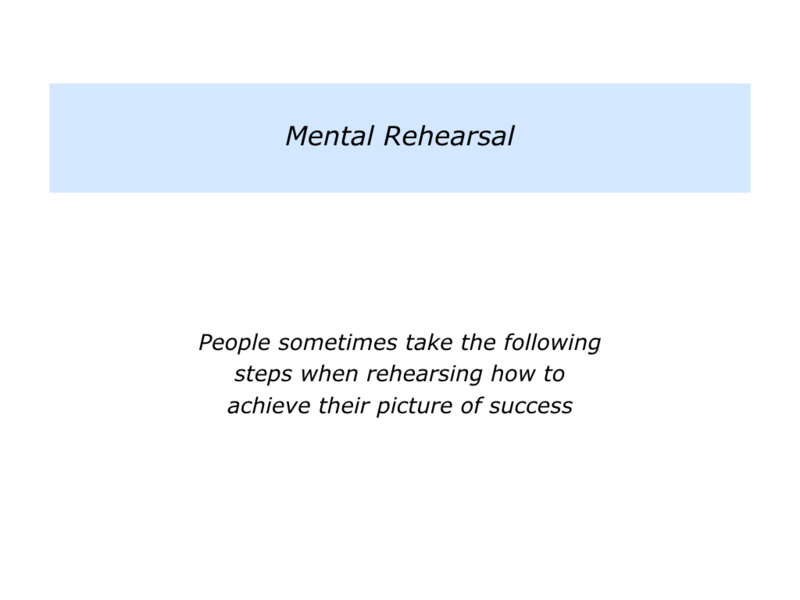 Sometimes this is not possible, however, so they do lots of mental rehearsal. 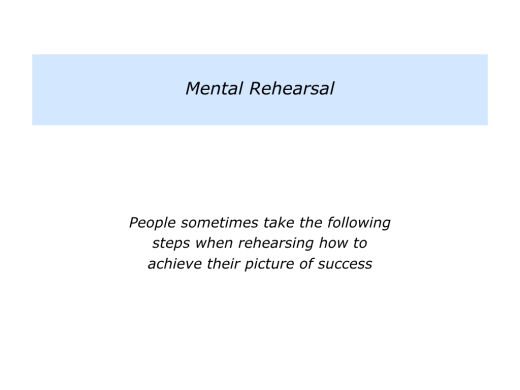 There are many approaches to such rehearsal and below is one framework. This involves relaxing and working through the following steps. 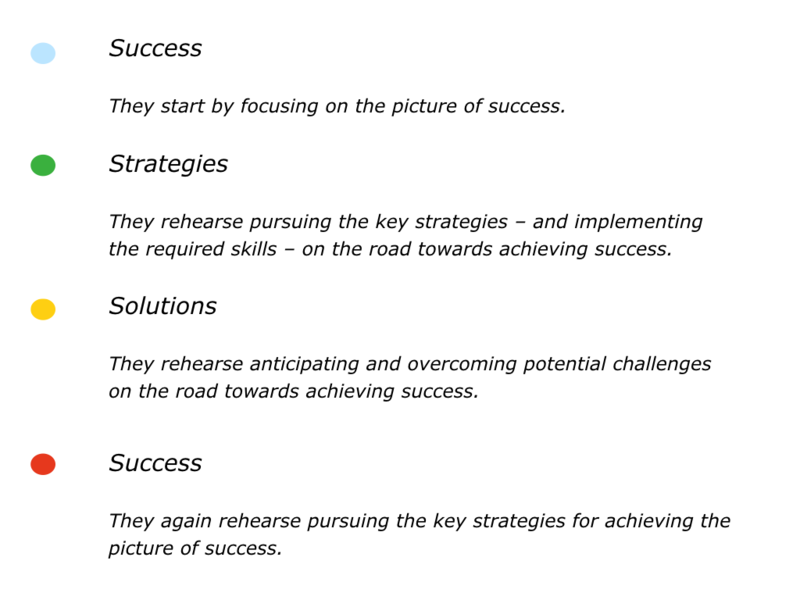 Imagine that you have refocused and also rehearsed implementing the strategies to achieve your picture of success. It will then be time to move on to the next stage. “Preparation is crucial. Going into the arena, I then need to hit the ground running and follow a certain rhythm. “My best performances have come from being able to get into my rhythm. 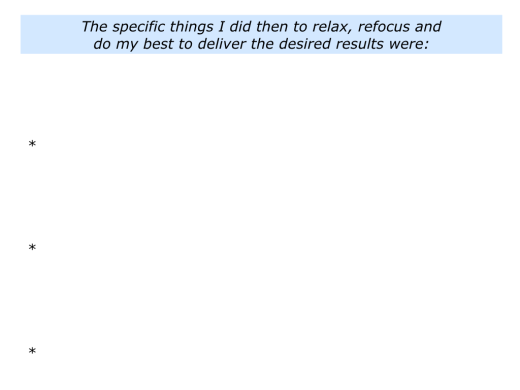 I have then been able to deliver the required results. Different people develop different rhythms for doing fine work. Sometimes it can take years, however, before people find and follow their best rhythm. One approach is for individuals to organise their time in blocks. They do this when planning a day, week, month or even a year. They set aside time to relax and refocus. They then go into the arena and deliver the results. If a person is a creative artist, for example, they may have a certain ritual for clicking into action. They may work for a set time, take a break and work for two hours. It may then be time to go for a walk, before returning to the work and continuing until they feel empty. 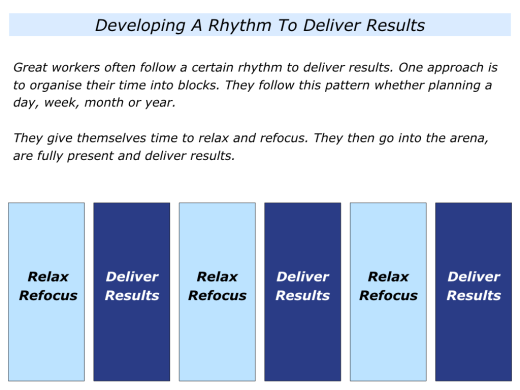 This approach is obviously more difficult if you work in an organisation that has a certain rhythm. As ever, the key is to focus on what you can control in the situation. “Internal meetings remain a challenge, however, and I prefer those where I know the agenda. So I did two things. 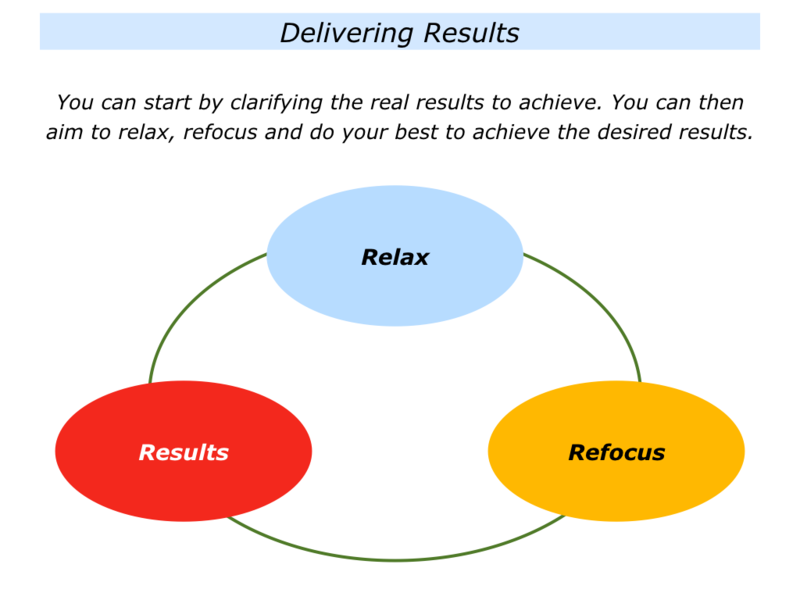 Looking ahead, can you think of a situation when you may want to relax, refocus and deliver the desired results? You may want to take these steps when making a transition in your life, doing a particular project, tackling a challenge or whatever. What can you do to relax and recentre? 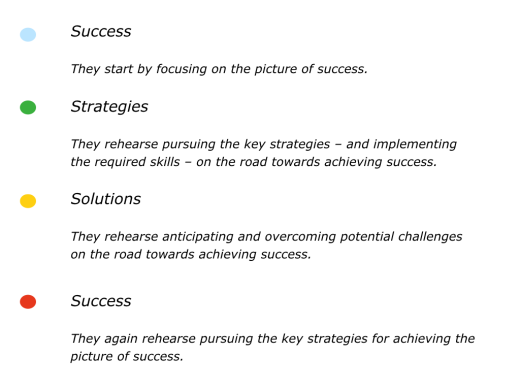 How can you refocus and rehearse pursuing your chosen strategies? How can you do your best to achieve the picture of success? 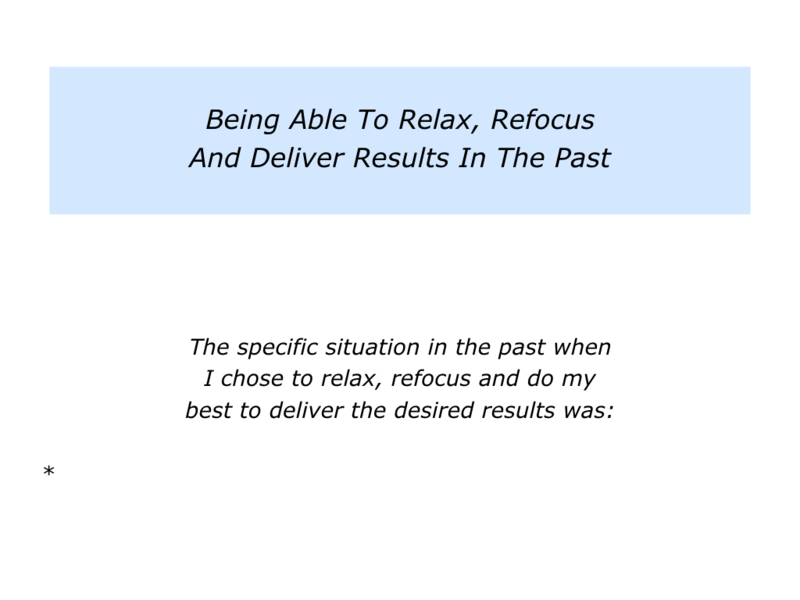 Describe a specific situation in the future when you may want to relax, refocus and do your best to deliver the desired results. 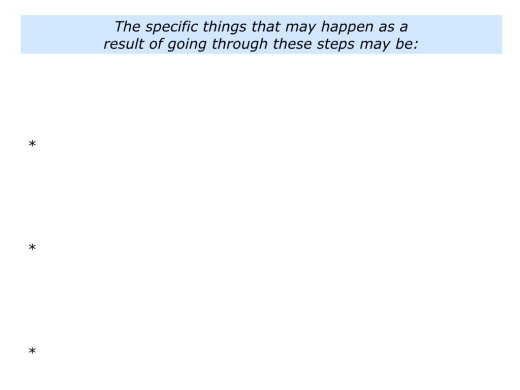 Describe the specific things you can do then to go through these steps. 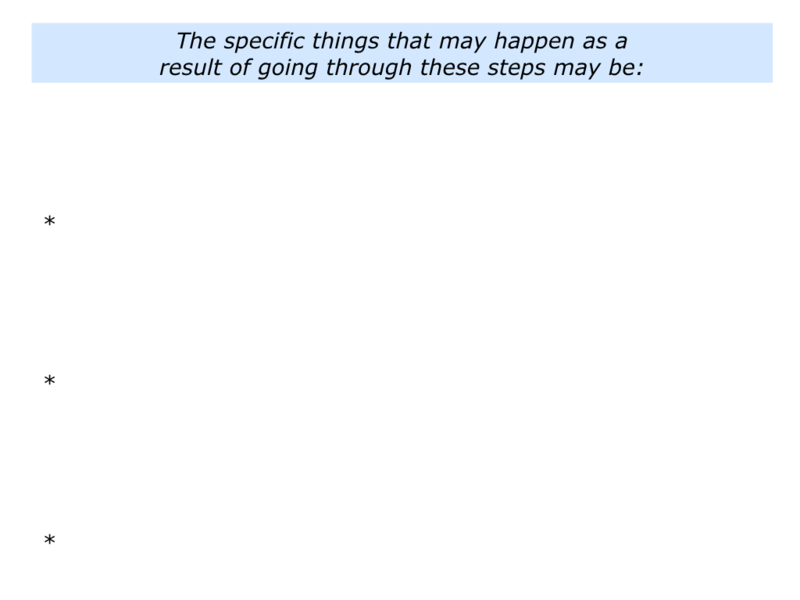 Describe the specific things that may happen as a result of going through these steps.